There is a legend behind these Neiman Marcus Cookies! It is rumored that the recipe for these triple chocolate chip oatmeal cookies with blended walnuts was sold for $250! After one bite, you will believe these Neiman Marcus Cookies are worth the price! I wanted to kick of the Christmas baking with a bang with my all time favorite cookie, the Neiman Marcus Cookie! There is nothing better than a freshly baked cookie that is oozing chocolate right from the oven. And this chocolate chip cookie, well let’s just say it has a bit of a story behind it that makes it worth quite a bit of loot. I am sure several of you have heard the infamous story of how a women at a famous department store begged for a recipe of a baked good she had eaten at their cafe, only to receive a bill in the vicinity of $250. She expressed her anger for this rather large bill by sharing the recipe with anybody and everybody. Is the legend true? I doubt it, but I will say this recipe for Neiman Marcus cookies is DELICIOUS and a must have chocolate chip cookie recipe. Move aside chocolate chip cookies–there is a new player in town and this Triple Chocolate Oatmeal Cookie came to give every soul the dose of chocolate they crave and desire. This Neiman Marcus cookie recipe is a little bit of this and a whole lot of that, for one irresistible cookie that is soft, chewy, and filled with chocolate. Butter–what is a cookie without pure, rich butter?! Mix together blended oats, flour, baking powder, baking soda, salt, blended nuts, and chocolate together in large mixing bowl. In separate large mixing bowl, cream butter and sugars together. Add in eggs and vanilla extract and beat until creamy. Slowly mix in dry ingredients into creamed sugars. Roll cookies into even balls. Almost all cookies start with room temperature butter. But what do you do if your butter is ice cold and you want that cookie NOW? Use your microwave? NO NO NO!!! Unwrap your butter, place in large bowl. Nestle the large bowl over a smaller bowl that is filled with hot tap water. Let the butter sit out while you gather ingredients and magically room temperature butter. This recipe calls for 2 1/2 cups of blended oatmeal–which is basically oat flour. 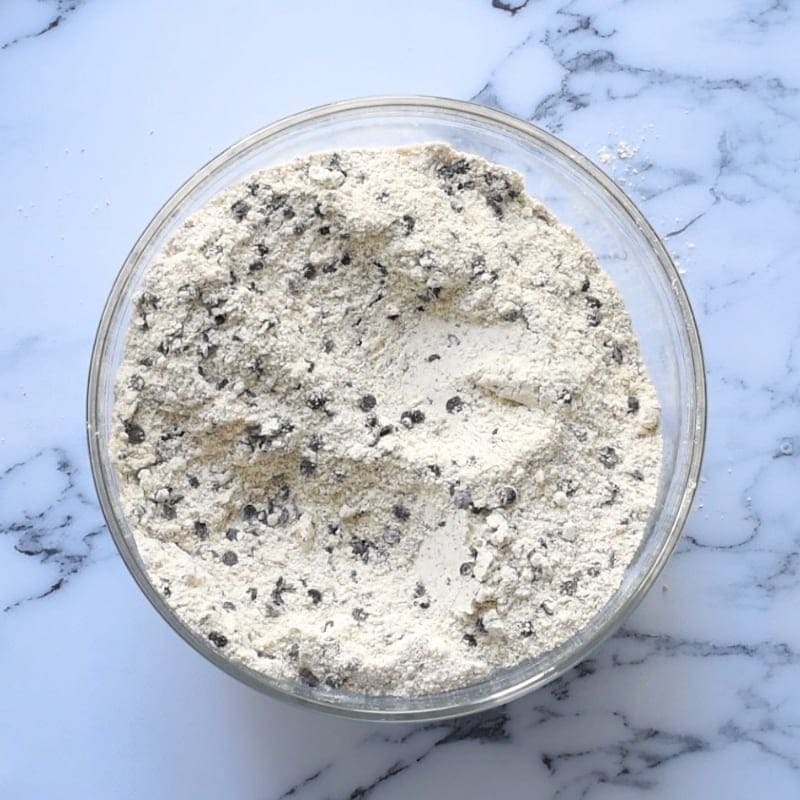 Place oats into blender and whirl away until a powdery substance forms. The important part of this is to measure the oats AFTER you blend them, not before–baking is a science. This recipe also calls for 1 1/2 cup blended nuts. Place nuts in blender and pulse until small chunks of nuts remain. I know, I know…so many ingredients. But that is why these cookies are so darn GOOD!! To grate chocolate, use 4 oz of your favorite chocolate bar. Be sure your chocolate is cold. You can use a hand grater, box grater, or food processor and grate chocolate bar into small shreds. Pro Tip: Use food processor to blend oats, blend nuts and grate chocolate bars to cut down on dishes. My family adores these cookies and we are asked to bring them to just about every event we attend the Holiday Season. But they are best freshly baked–aren’t ALL cookies?! In order to have these cookies freshly baked all through the season with ease, I freeze the cookie dough. 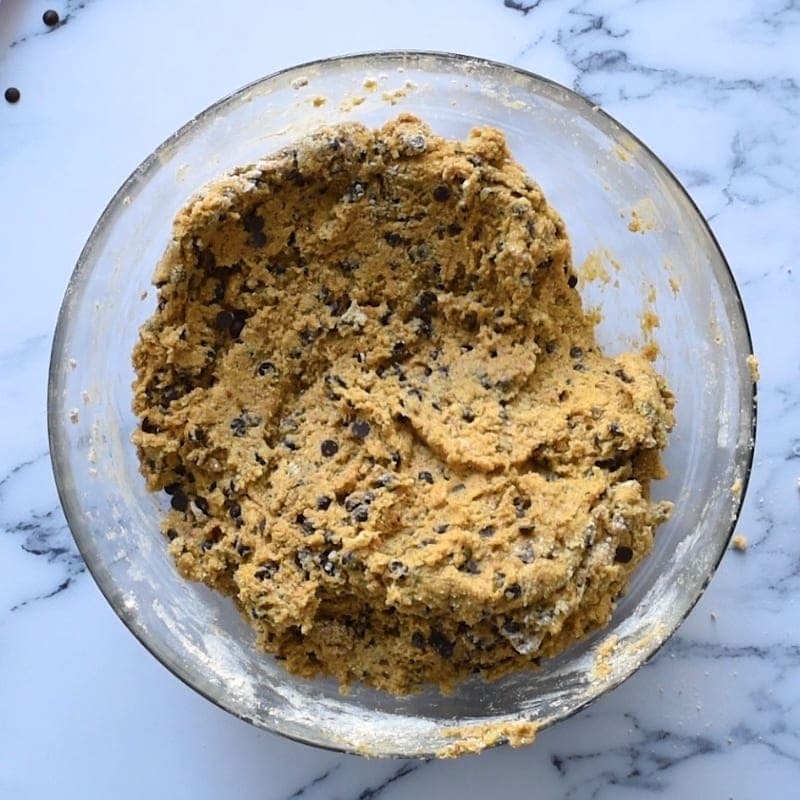 Make a large batch of cookie dough. Place them on wax paper/parchment paper lined rimmed trays and freeze for 1 hour. Transfer the balls to a freezer safe storage bag. When wanting to eat, bake at 375 for 8-10 minutes directly from freezer. Make sure your ingredients are at room temperature to ensure even mixing of cookie dough. Butter should be soft to the touch. Eggs should not feel cold to to touch. Be sure to refrigerate batter after blending together. 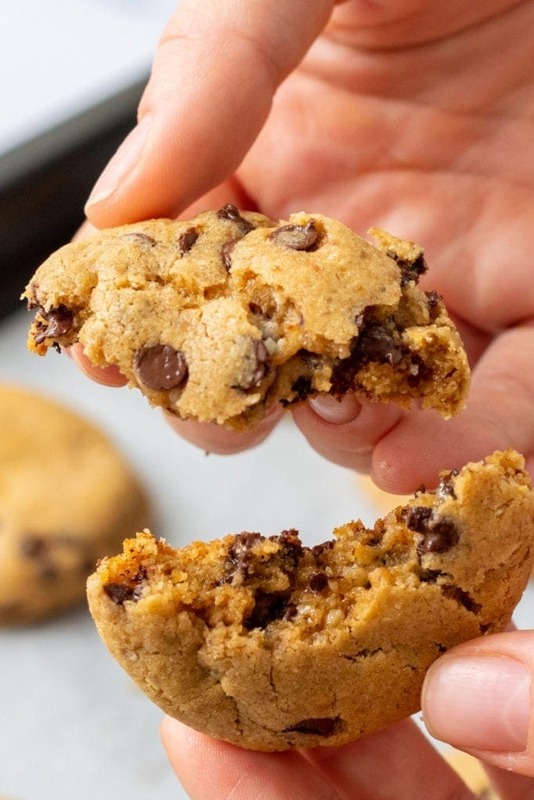 This allows the butter in the chocolate chip cookie batter to get cold which will let your cookie rise and be fluffy, instead of having a flat cookie. Refrigerate for at least 30 minutes, up to 48 hours. Be sure all cookies are uniform in size. Use 1 1/2 tablespoons for each cookie. Roll into even ball. Alternatively you can use an 18/8, or #40 cookie scoop. Allow your oven to be preheated to correct temperature to let cookie bake properly. Bake until center is JUST set, and lightly browned. Cookies will continue to bake on cookie sheet for 1-2 minutes after they are removed from oven. Cool on cookie baking rack. After 2 minutes, remove cookies from baking sheet and let cool on cooling rack. 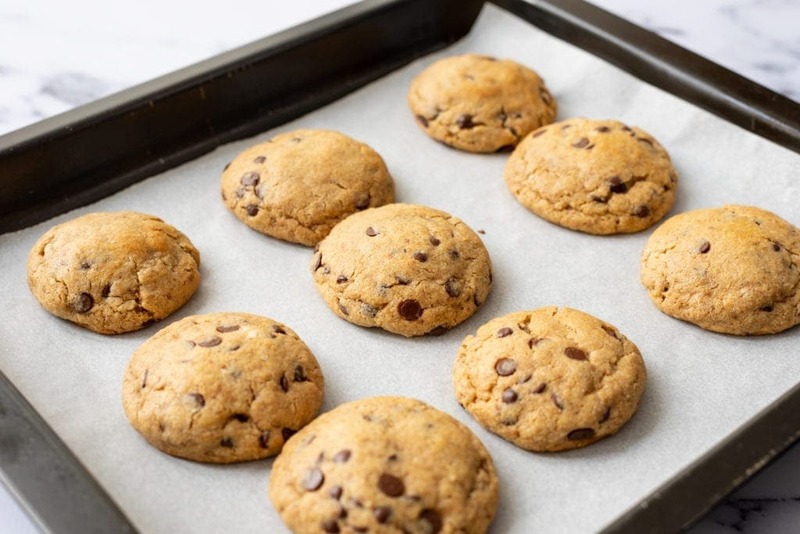 Bake on nonstick cookie sheets or use parchment paper to ensure cookies will not stick to pan. A triple chocolate chip cookies with blended oatmeal and blended nuts for an out of this world chocolate chip cookie. In a large mixing bowl or stand mixer, cream butter and sugars together until fluffy and light in color--about 7-8 minutes. Add the eggs and vanilla and beat until well combined. Stir the dry ingredients in the wet ingredients until just combined. 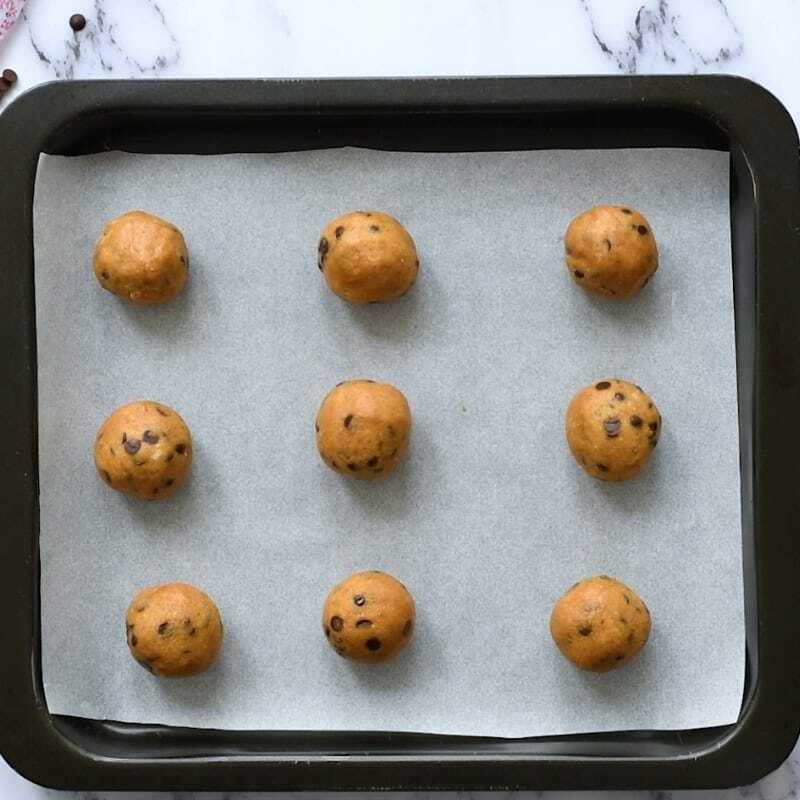 Using 1 1/2 tablespoons for each cookie, roll into a ball. Bake for 6-7 minutes, until edges are lightly browning and centers are still a bit jiggly. Cool on cookie sheet for a minute or two before transferring to a cooling rack. you are so smart with the freezing (!!!) we are a family of three and I just seem to always make wayyy tooooo many. ooh I just made some kitchen sink like brownies! your cookies look so YUM! Thanks Jennifer. These cookies are drool worthy! I am sure your brownies were crazy good!! Thanks for the softening butter trick. I usually sit for a while attempting to mash the butter to “soften” it. This water trick makes so much sense though! Also, these cookies look amazing. I love the mix of dark and milk chocolate. I cannot wait to try! You are welcome. Another trick is to grate cold butter with a cheese grater–but why dirty a grater and do the extra work? Thanks Amanda! I would pay $250 for this recipe for sure!! Totally craving one of these cookies right now, they look and sound delicious! Three kinds of chocolate!!! YUM! You are the best Christmas elf spreading cheer and tips for cookies! I have never had a kitchen sink cookie, but I can tell I would love them! I mean, what’s not to love? 🙂 These look absolutely delicious! These cookies look delicious! Thanks so much for sharing with Full Plate Thursday this week. Hope you have a great weekend and come back soon! They sound so good! I love homemade cookies. Thanks for linking up to the Bloggers Brags Pinterest Party! I’ve pinned your post to the Bloggers Brags Pinterest Board. These cookies sound wonderful! I love having frozen cookie dough on hand too. It is saved me so many times when unexpected guests have popped by. The frozen cookie dough can help cut down on Holiday Stress levels as well!! Thanks Kimberly. I was had a day today so I am actually sitting here catching up on DVR, emails and eating some. Pure therapy!! All I can say is – thank goodness this recipe makes 6 dozen cookies. All my cookie exchanges seem to be calling for 4 dozen cookies this year, so this way I’ll have plenty of these cookies FOR MYSELF. And thanks for the super-helpful tips! I never would have figured out how to do the blended oatmeal thing on my own. And yes, at the holidays, we need more than just 2 dozen cookies 🙂 Enjoy!! I’m officially drooling over these beautiful cookies, and I love the story behind them. 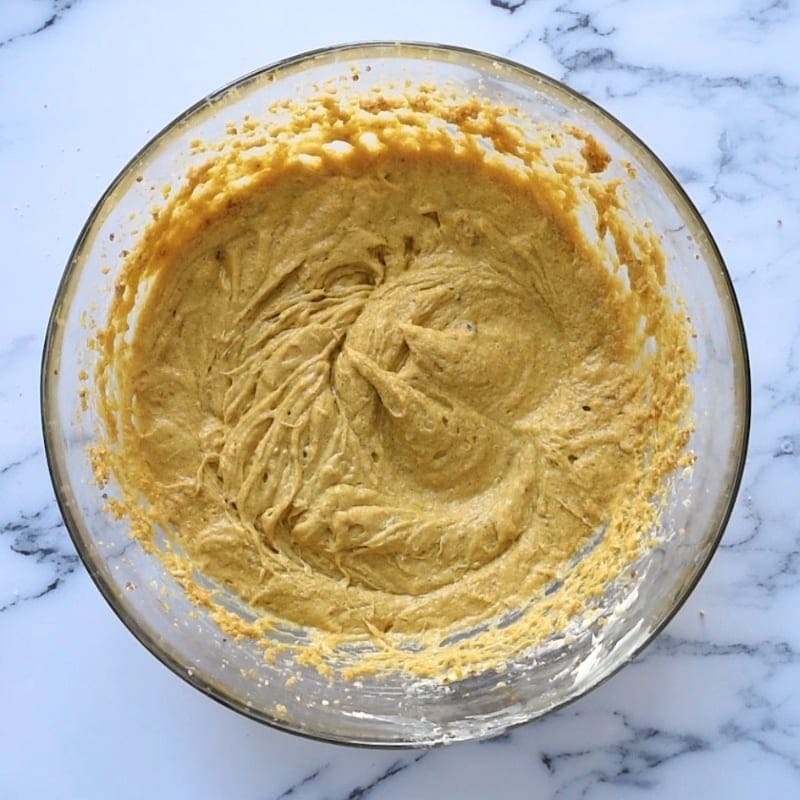 I also love how you break down exactly what you’re supposed to do in this post because I think blended oatmeal and nuts would throw me off… And that’s a great tip to get butter to room temperature without using the microwave! I am glad the tips helped! I hope you enjoy these. I may go have one for a morning snack! I have never heard of the $250 cookie, or any baked good. But, these look delish! Thank you for linking up with the Online Christmas Cookie Exchange. I have pinned this to the group board. Wahoo!! So glad you enjoyed these cookies as much as we do.